Bill Clinton has collected more than $17 million from taxpayers since leaving office, more than double that of fellow Democrat Jimmy Carter. Clinton received nearly $1 million from the United States government in the 2015 fiscal year to pay for his pension, his staff, and more than 8,000 square feet of office space in New York City, according to the nonpartisan Congressional Research Service. The Clintons earned more than $10 million in 2015, according to tax returns released to the public. The Clinton family has amassed a fortune in the form of six-figure speaking fees, mansions in New York and D.C. worth an estimated $8.2 million, and some of the largest multi-million dollar book deals in history since leaving the presidency "dead broke" in 2001. Hillary and Bill Clinton revealed that they had assets valued between $11 million and nearly $53 million on her 2016 campaign finance disclosures. Some have estimated that the couple has a net worth of more than $100 million. The power couple earned nearly $30 million in 2014 alone. That year, Clinton charged the taxpayers $950,000 to cover his pension and expenses. 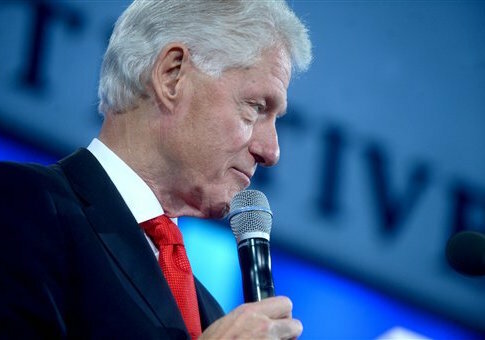 Taxpayers provide a steady stream of income to the Clintons each year with a pension indexed to inflation that catapults the former president into the top 5 percent of American earners. The $218,000 he received from taxpayers was nearly four times higher than the national median income of $56,516. It was the largest pension check of any of the four living presidents, although President George W. Bush surpassed Clinton’s total spending after security costs, office space, and miscellaneous charges are factored in. "The pension and benefits paid to former Presidents George W. Bush and Clinton in FY2015, when added together, comprise 62.2% of all benefits paid to the four living former Presidents and the widows of the former Presidents," CRS found. Clinton has received more than $17 million since 2001. That is nearly twice as much as the $8.6 million that Jimmy Carter has received and 35 percent more than George H.W. Bush. Bill Clinton also continues to collect a pension from Arkansas from his tenure as the state’s governor. He indicated on FEC filings that he continues to draw more than $1,000 each year from the state. President Obama will join the ranks of retired presidents in January. The White House has asked Congress to budget nearly $3.9 million to cover expenditures from the five former presidents in 2017—an 18 percent increase from 2016. That money will come in addition to the $9.5 million Obama requested for the expected transition, a 19 percent jump from the $8 million George W. Bush budgeted in 2009. This entry was posted in Issues and tagged Bill Clinton. Bookmark the permalink.